If you are some blogger-who wants to increase the visibility of his blog among followers, or a marketer-who wants more conversion from twitter or someone who wants to improve his presence on twitter – then I bet this article will definitely help you. Let me start by asking you a question, are you using a Twitter App that Schedules your Tweets and posts it during best hours of the day? If not then you better get started using it. I bring to you a new Twitter App “Timely”. 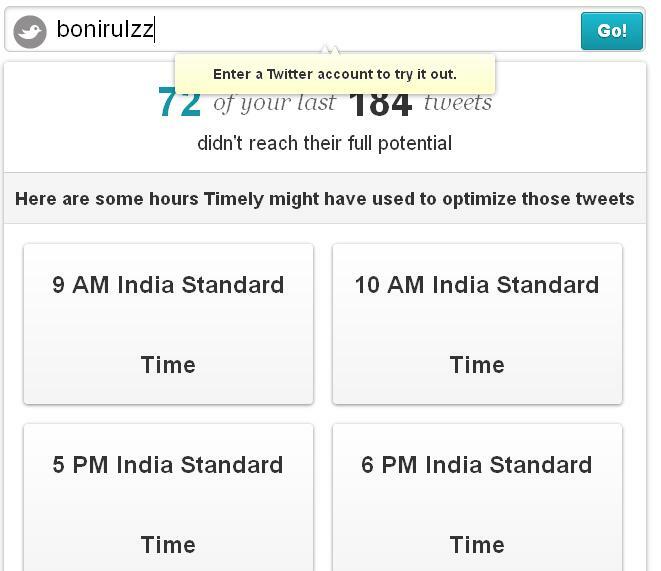 A simple Twitter App that will schedule your tweets for maximum impact. It will post the tweets when maximum numbers of your followers are awake. It will make your each tweet count. It helps you to make followers do what you want them to do i.e. more retweets, more clicks, more mentions, more followers. -Timely will analyze your last 199 Tweets and figure out the best time slots to tweet. 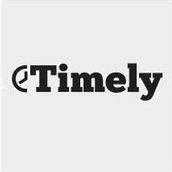 – Hence, next time when you submit your tweet to timely, they will post when most of your followers are active. Right Side of the dashboard shows you: Total number of tweets published, Retweets you got and Reach-number of users who saw your tweets (Including the users of your follower if he retweets). These figures will help you in identifying the impact of you tweet. As you can see it tells me 3 users clicked my link, it was retweeted once and total numbers of users who saw my tweet were 115. So, overall it not only helps you post your tweets at the best time but also reports you back with your tweet impact. I may sound to you highly obsessed with this Twitter App, but seriously I find it way much better than other similar Apps like Buffer, Hoot Suite and Tweet Deck. for the substantial overview, but The genuinely supporting the newest Zune, as well as hop this particular, plus the fantastic evaluations many other individuals have compiled, can help you decide if it’s the right choice for you. Since Timely is on its way out this month what would be a good app to go to? Yeah, i heard that too, i guess “buffer” is the next best one for the same.